Also agreed upon at that Chicago meeting discussed last time were some other eligibility rules. The change viewed as the most important was one that disallowed freshmen from competing on varsity teams. The thinking behind this was that requiring athletes to have completed a year of work at the college prior to playing on that school’s varsity squad would eliminate the use of non-students as players on college teams. Another rule change, one that is still in effect more or less, is that athletes who transfer from one school to another must sit out a year before representing the new school. A third change allows students to participate in three games without that year being counted against the student’s eligibility. That way, players who were injured early in a season wouldn’t be penalized. This rule may have eventually led to the red-shirting of players that is so common now. The freshman rule proved to be controversial, particularly with the smaller colleges. At that time student bodies were a fraction of their present size. A large college or university might have 3,000 students whereas a small school might be half of that. Many small schools felt that not allowing freshmen to play on their varsities put them at a disadvantage to schools with much larger student bodies. Large schools like having the advantage. Watching Michigan playing Bowling Green today, I saw a formation that looked familiar. In that formation, Michigan’s backs were all in the backfield, arranged almost in a box. Any of the four backs could receive a direct snap from center, at least in theory. It wasn’t the only formation I saw RichRod use in the game and probably isn’t his primary formation. However, he did use it for multiple plays and for sizeable gains. After a few moments’ thought, I remembered where I had seen a similar formation before. I could be wrong about his formation due to not having a diagram of it, but it sure looked familiar on TV. 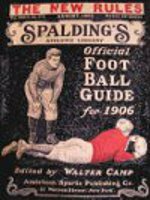 Page 113 of Pop Warner’s 1912 book, A Course in Football for Players and Coaches, begins a discussion of Warner’s Open Pass Direct Pass Formation (see bottom of this message). 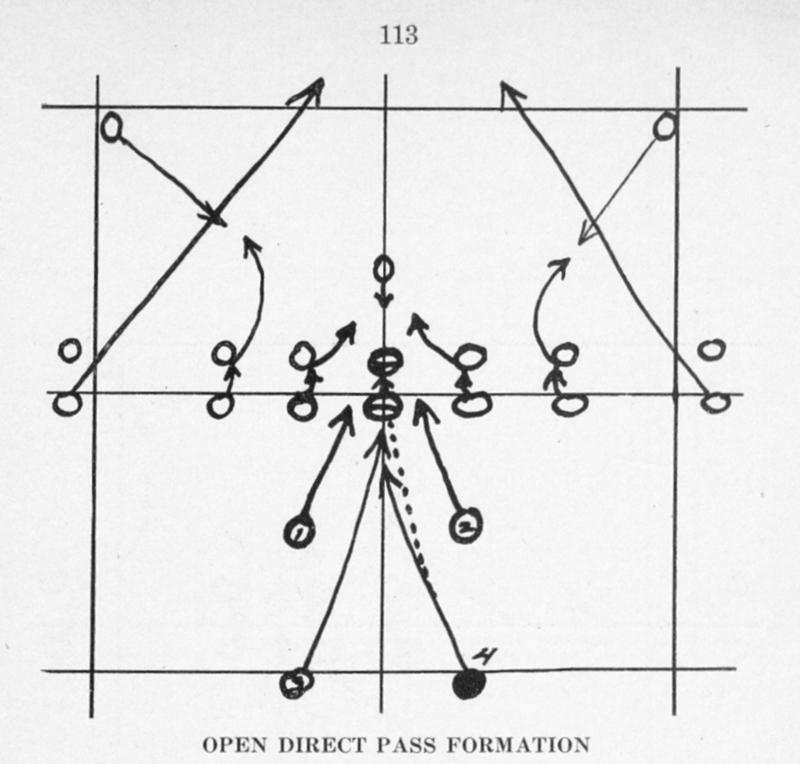 The diagram for this century-old offensive scheme is a bit different than the one RichRod uses but provides the foundation upon which his is based. Both offenses feature direct snaps to multiple backs as well as both pass and run plays from the same position in the formation. A difference between the formations appears to be that Rodriguez moves backs 1 and 2 to behind the tackles where Warner had them behind the guards. One assumes that the wider position helps make backs 1 and 2 more effective blockers for off-tackle plays and end runs. They might even assist with protecting the passer. 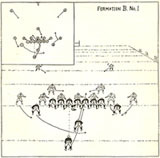 Warner included a note stating that experience showed that moving the ends closer to the tackles had proved more effective in blocking the defensive tackles than having them set wide as shown in his diagrams. A difference between Warner’s plays and those used today is that today centers lob the ball back, generally to the quarterback, where Warner’s centers often led the back receiving the snap. Warner’s scheme requires highly skilled centers but gives the offense advantages over those in which the back receiving the center snap stands flatfooted waiting for the ball to arrive. Last weekend, we entertained some houseguests by taking them for a tour of Gettysburg Battlefield. In the evening afterward, one of our guests mentioned that her grandfather, an immigrant from Poland who lived in the Detroit area, had served in an all-Polish unit in the U. S. Army during World War I. I recalled from researching William Gardner (a chapter of Doctors, Lawyers, Indian Chiefs is devoted to him) that he was put in charge of an all-Polish unit at Camp Custer during WWI. Captain Gardner is in a unique position in the new army, for in the assignment of recruits to the various regiments and companies he was given a large group of men of foreign extraction from Detroit, nearly half of his company being of Polish extraction. Of the Polish contingent in Captain Gardner’s company there were many who could not speak or understand English so the first problem of this real American officer was how to make His new soldiers understand the language in which they will fight. Gardner, however, in his first problem of his new life in the army, showed the same resourcefulness which made him the terror of foes whom he had met on the gridiron, for he immediately detailed one of his lieutenants to begin to learn Polish. 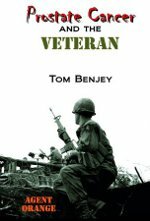 The lieutenant began his duties, learning the Polish words for such commands as “squads right,” and “right face” and when Gardner’s commands were given to the company in English, the lieutenant repeated them in Polish for the foreign born soldiers in Uncle Sam’s army. The Poles were so pleased at Captain Gardner’s efforts to help them learn to fight for their new country that they took to drill with a will. Recently, a young man, who I will call Chapman, a twenty-something who is on his way to becoming a lawyer, described my books as being “non-mainstream” and concluded that I may be strange, for picking such subjects I suppose. While I may be strange, especially to a young person, there is nothing strange about the topics of my books. Perhaps someday he will come to learn that being “non-mainstream” is a good thing. The world doesn’t need another book on Lincoln; it doesn’t even need another one on Jim Thorpe. What is needed are books on people whose contributions should be remembered but won’t if someone doesn’t capture their life stories before they are lost to posterity. I only wish I had undertaken this earlier, while more of them were still alive. My hat is off to Bob Wheeler for having the vision as a young grad student with no money to first convince his advisor that an aural history of Jim Thorpe was a worthwhile undertaking and then to hitchhike across the country to interview anyone still alive who knew Thorpe. I wish that I had had the vision to interview my grandparents, uncles and aunts when they were still alive, but I didn’t. Not only is part of my family’s history lost, but since few others had the vision to capture their families’ histories, we have lost much of our history collectively. 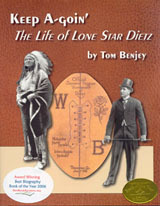 There are rewards to researching and writing these books, albeit not financial. This enterprise is akin to what the Iowa farmer alluded to when, after winning an $8M lottery and asked what he intended to do, he responded, “Keep on farming as long as the money holds out.” The real rewards come from the satisfaction of having played a small part in helping a families learn more of their own history or, occasionally, helping long-lost family members reconnect. 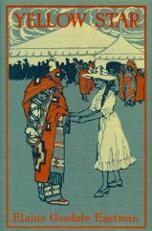 Chapman, if you think Carlisle Indian School football players are an obscure topic, you should watch Book TV on CSPAN2 some weekend. There you will find some really obscure book topics but, if you’re lucky, you’ll also see Robert Caro and come to value his work which is at such a high level that the rest of us can only aspire to reach. Caveat emptor or let the buyer beware has never been more appropriate advice for ebay buyers than with regard to three items that are up for sale now for large prices. Apparently Mitchell Pierce, Seneca, of New York State, accumulated a collection of artifacts during his life that are now being sold after his death. Three items that readers of my blog may be interested in are photos identified as being of Carlisle Indian School football players circa 1910. My research has found nothing to suggest that Mitchell Pierce ever played on Carlisle’s varsity squad. It has shown that he departed Carlisle several months before the start of the 1910 season. The outfits worn by these individuals or small groups of players appear to be Carlisle uniforms based on the stripes on the forearms and socks. Also, the backgrounds look similar to those on photos known to be genuine. A couple of them may have been shot on Carlisle’s home field. I have made no attempt to identify the players in the photos and don’t know what Mitchell Pierce looked like. My guess is that these photos are of Carlisle students, but not necessarily those who played on the varsity squad. The second and third photos aren’t immediately identifiable as being of Carlisle students or having been taken at Carlisle. The backgrounds in the photos are not similar to those I have previously seen in Carlisle photos and the uniforms are also very different from those in the first set of photos. I checked with an expert on such matters, Richard Tritt, photocurator at Cumberland County Historical Society. Richard was not able to identify any of the individuals and the backgrounds were not familiar to him either. There is no photo of Mitchell Pierce in the CCHS collection, so Richard was not able to identify him in the photos. If Richard can’t tell if these photos were made at Carlisle, few people could because he has seen hundreds if not thousands of photos to compare these with. While the uniforms in these photos are clearly not those of the Carlisle varsity, the possibility exists that they are of shop or organization teams. 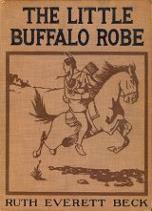 Major Mercer once told a reporter that he had to outfit 14 different football teams at Carlisle. His approach was to buy the varsity new uniforms every year and to hand their old ones down to his other teams. Unfortunately, few photos have been found of shop teams and none of teams for the band or literary societies. Follows is a photo of the Shoemakers’ team. A photo of the Blacksmiths also exists. The Blacksmiths have large Bs sewn on their jerseys and two lettermen as coaches. Varsity socks are visible on one of the Shoemakers and a letterman holds their ball. 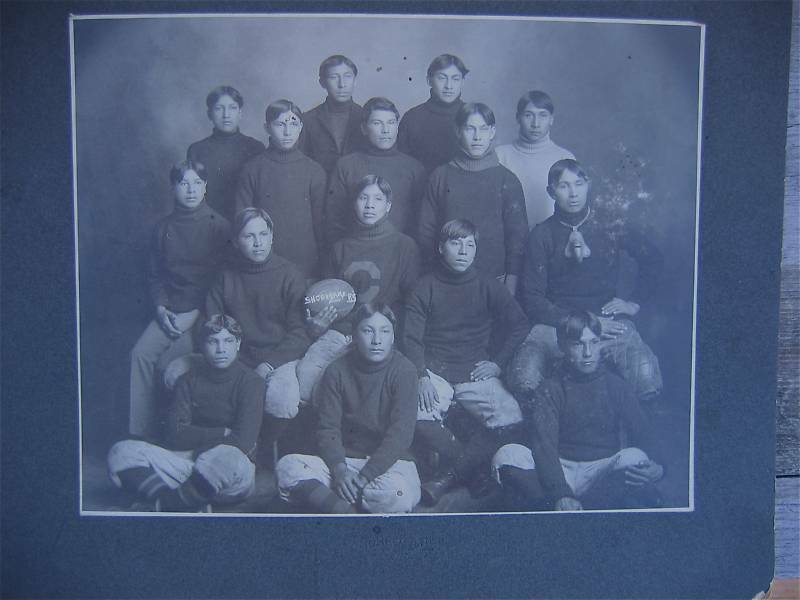 Another possibility is that these team photos were taken at an on-reservation Indian school. I haven’t seen Pierce’s student file, so don’t know if he attended another school before coming to Carlisle. He may have because it was not uncommon for Carlisle students to have begun their education elsewhere. These photos may have been taken at that school. Regardless of the origin of these highly priced photos, let the buyer beware.